ATTENTION FLIGHT: Effective 1 MAR 2017 the Phamus Phoenix Phorum was relocated to FACEBOOK ... need help? Attention Flight: Gary Earls has finished compiling an updated Phoenix Unit History, which he describes as "a never ending project." Click here (or History on the menu) to enjoy this very comprehensive read. 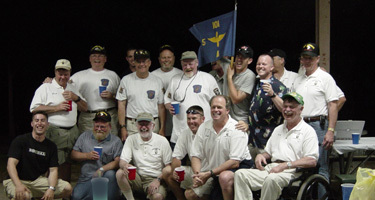 Many of the Phoenix gathered in Fruita, Colorado for the July 2003 dedication. The memorial was founded by Jim Doody, whose older brother Tom was a Phoenix KIA during Lam Son 719. Note the big blue dot on the tailboom! This website is for the Phoenix and our history. Send feedback or relevant content for addition to the webmaster (Ted Olson, Phoenix 65). Content from this website may be reused only for noncommercial purposes. Permission for commercial use may be required, please contact the webmaster or other names or copyrights where noted.